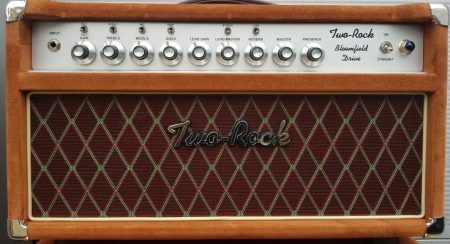 Many Two-Rock amplifiers over the years have been two-channel, cascading gain style amps and this year of making tone machines brings the newest 2 channel workhorse amp by Two-Rock, the Bloomfield Drive. Revisiting our classic 2 channel platform and much like our newest product lines, the Bloomfield Drive comes stock with our new proprietary output transformers that allow for 4 x 6L6 power tubes switchable from 100 to 50 watts and 4 x 6V6’s switchable from 40 to 20 watts without any impedance mismatch or sacrifice of tone and feel. The responsiveness, depth and bandwidth of the clean channel is instantly familiar, and cascades to an articulate and touch dynamic lead channel that is a pleasure to play. As an extension of the clean channel, the new lead channel gives the player rich harmonics, added gain, and a beautiful sustain or add the foot-switchable tone stack bypass to either channel and push the amp to another dimension of overdrive tones. The Bloomfield Drive features a new sophisticated all tube spring reverb circuit specifically designed to not interfere with the overdrive channel and still retain clear note definition, a sweeter top end and maintain touch sensitivity when you push the gain. With a Send and Return control, you can shape your reverb to the room or vibe you are trying to achieve. In addition, the Bloomfield Drive features endless tone shaping options in the tone stack with toggle switches for added boost on the EQ and choice NOS part selections. 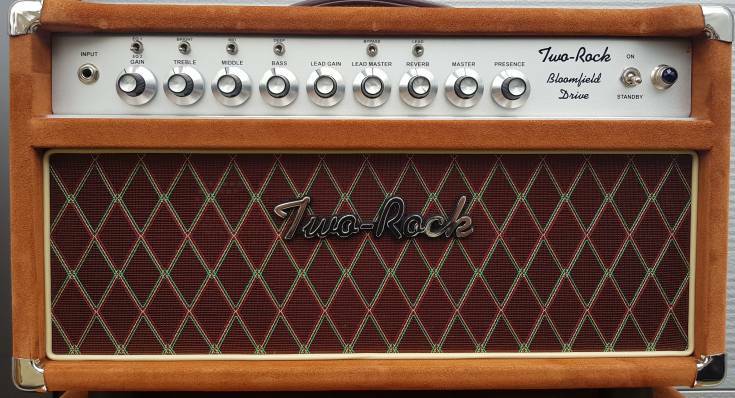 Along with the 100 and 50 watt heads, we’ve added a 40 watt 6V6 combo because the overdrive in this format is simply unforgettable. Add in the power scaling on the 40 watt amp and you have a 20 watt monster in a portable combo with our TR1265B speaker. Our newest trade dress puts this amp in a sleek silver or classic black anodize with gray tolex, silver thread cloth and blue accent piping. 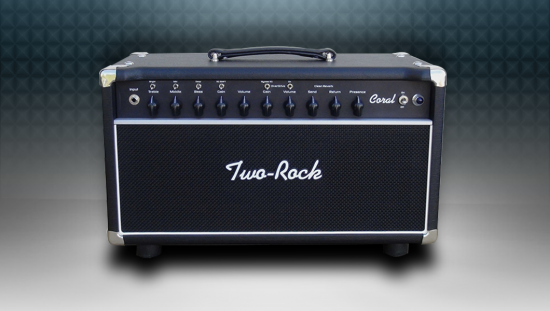 Not only will you stand out on stage with rich overdrive tones and classic Two-Rock cleans but so will your rig. 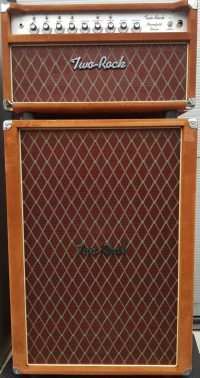 Bloomfield 50 head , burgundy suede.